Following the shooting of nine black church members in Charleston, South Carolina, on June 17 that sparked national debate about Confederate symbols, Student Government President Xavier Rotnofsky and Vice President Rohit Mandalapu started a petition for the removal of the statue, calling renewed attention to the Confederate symbols on campus. 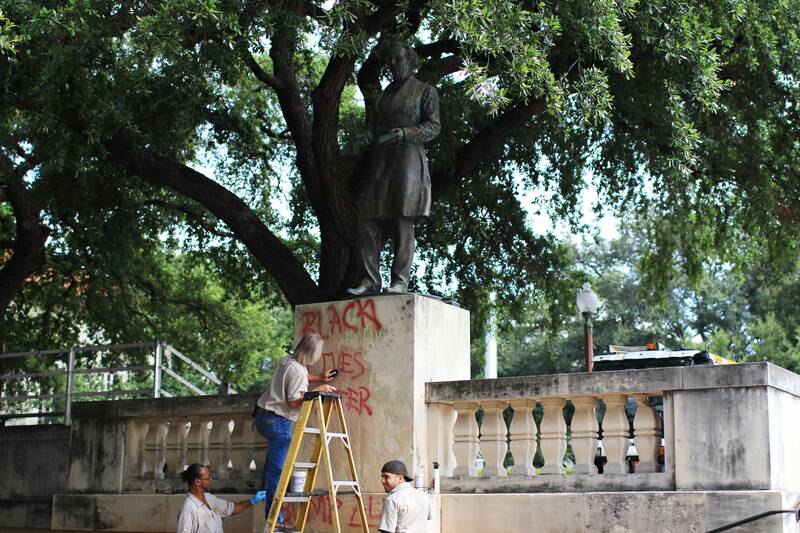 University officials took action after the statues of Davis, Robert E. Lee and Albert Sydney Johnson were vandalized June 23 — the third such vandalism this year. The next day, Fenves announced the creation of a committee of student leaders, staff and alumni to analyze and assess alternative options for the statues’ future on campus. Gregory Vincent, chair of the task force and vice president for Diversity and Community Engagement, said he believes Fenves will take the committee’s recommendations seriously. However, in 2003, when a different task force met to discuss the Davis statue, the University made no changes. The national debate surrounding Confederate iconography has caused many people and institutions to examine Civil War-era monuments more closely. Vincent said he understands why the presence of the statues are now a concern to students. When the statues were first proposed by George Littlefield during the early 1900s, they were to both symbolize the unification of the North and South and pay homage to Littlefield’s personal heroes. Davis was the president of the Confederate States of America from 1861 to 1865, during the Civil War. His statue was installed in the Main Mall in 1933, but controversy did not arise about the monument until nearly six decades later. The current controversy surrounding the Davis statue was reignited this year when Rotnofsky and Mandalapu made the removal of the statue part of their campaign platform. From the time Rotnofsky and Mandalapu brought renewed attention to it, the Davis statue was vandalized on three separate occasions. The first vandalism took place March 2, when the word “Chump” with an arrow pointing toward Davis appeared on the statue in blue chalk. One day later, Rotnofsky and Mandalapu drafted a resolution to remove the statue and submitted it to SG, which nearly unanimously approved. The second incident occurred April 16, with the phrases “Davis must fall” and “Emancipate UT” written in red and yellow spray paint. The third and latest incident happened June 23, when Davis and statues of Confederate generals Robert E. Lee and Albert Sidney Johnson were marked with the phrase “Black Lives Matter” in red spray paint. One day later, the University announced the formation of the task force. Vincent announced the University would hold two public forums in July to open the discussion up to the public. A majority of speakers at the first forum, held July 7, were more supportive of removing the statues, whereas the members of the second forum, held July 15, were more divided between those asking for the Davis statue to be left in place and supporters of its removal. As the deadline for the committee’s recommendation approaches, the task force will need to compile options regarding the future of the statue for Fenves. Rotnofsky said the committee is considering a variety of options, such as relocating the statues to the Dolph Briscoe Center for American History, which Rotnofsky said would keep them on campus while preserving them for educational purposes. This article has been updated since its original publication to clear up a possible ambiguity. Correction: The original story contained a misattributed quote. The quote has been removed.